Durable and absorbent microfiber towel with center self fabric loop. Measures 16 x 32 inches. Although I carry multiple towels on my bag, this is really the only one I need. The waffle design clears out the grooves and the if you wet the corner it holds dampness throughout the round. I'd have given it 5 if the small strap for hanging it had some more ooomphff to it. Perfect size. Solid microfiber towel! I use this towel to clean my clubs! I drape it over my push cart out of the way and easy to access. Cleans clubs with ease! 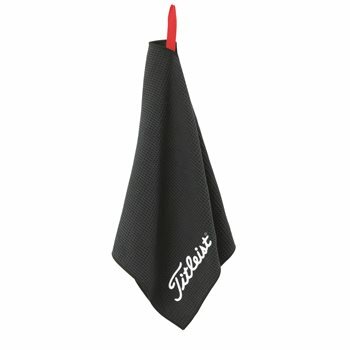 I also have the Titleist Staff Towel which I use to wipe the clubs clean. You don't need the other towel though, you can wet a quarter of the towel and use the other end to dry your club. Must have towel for anyone that golfs! As far a towels go you can't go wrong with this one.